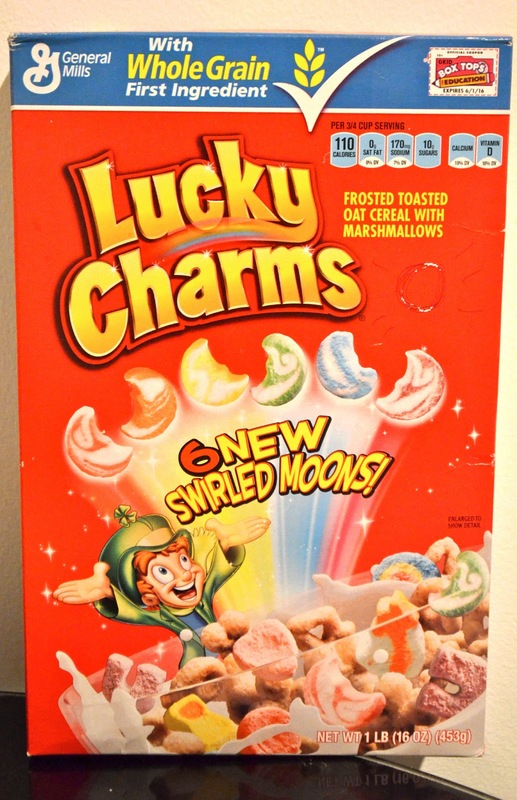 My poor dad had to do a horrible round-trip from Dublin to LA last week for work, and even though he barely got a wink of sleep and was green from all the time differences, he still managed to bring back my sister and I a box of Lucky Charms cereal. What a dad eh?! You can buy Lucky Charms in Ireland from a few different shops however they cost around the €9 mark, which I just refuse to pay for a box of cereal. Does anyone remember when we were kids and you could buy these in supermarkets here and you'd be badgering your mum to get them and she'd always say no?! Haha (sorry mum!). I don't think I could ever have a bowl of these to start my day, I imagine the mid-morning sugar crash would be awful, however small bowl after dinner is a big treat! 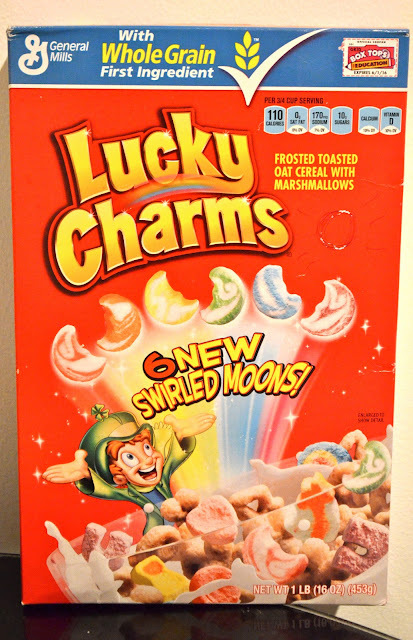 I was excited to see that they now have "6 new swirled moons", because the usual marshmallow love hearts, horse shoes, top hats, shamrocks, balloons, hour glasses, rainbows and stars just aren't enough. Oh no, more sugar shapes please! These new swirly moons come in the colours, red, orange, yellow, green, blue and purple (because it's always good to get the full spectrum of artificial colours in one go). I try to stay away from refined sugar as much as I can, but a little every now and again though is ok, but I have to admit I had a serious sugar high after even a small bowl of these. They are a real nostalgic treat. I probably only ever had a couple of bowls of Lucky Charms as a kid but they bring back lots of imagery of childhood, maybe it's the bright packaging or maybe it's the serious sugar rush you get after just one mouthful.What was your favourite cereal as a kid? *if you're wondering what the circle above the purple moon is about, my mum drew an "O" on the box so my sister and I could differentiate our boxes..hehe. We're 23 and 20 and she still does these kind of things for us, so sweet! I try to take pictures of my lunches most days, I can't help it! I take snaps of nearly every meal I eat now. So I thought I'd combine 4 of my favourite lunches from this week to show you. Lunch, sadly, is my least favourite meal of the day and a boring old sandwich just won't do, so I try to make it a bit special and different everyday. My dad came back from Italy last week and brought home some lovely piadine, said pia-dee-nay (essentially a thick flour wrap that's eaten at lunch time in northern Italy). I warmed it slightly in a dry pan, put a big fist full of rocket in the middle, 3 slices of grilled halloumi and homemade vegan pesto, wrapped it up and devoured it. Yum! I also had a lovely organic apple and a cup of coffee. I love bruschetta, so quick to put together and for me the simpler the ingredients the better. I love the traditional, toasted bread rubbed with some garlic, fresh tomatoes, torn basil leaves and a drizzle of olive oil. I also love half of an avocado sliced, a squeeze of lime, salt and olive oil. Both very simple but light and tasty. This was a really quick soup I put together, some fresh passata, rehydrated porcini mushrooms, garlic, chilli, veggie stock and finished with a drizzle of the same homemade pesto as before. Perfect on a cold day with a big mug of tea! The last favourite lunch of the week may look a bit sparse but it's actually really filling. A hard boiled egg (I love a simple hard boiled egg, no salt, just plain), a sweet organic apple and some crunchy almonds, pumpkin and sunflower seeds. Poor Isaac hates when I eat hard boiled eggs, the smell brings up bad memories so I try never to have this when he's at home hehe. If I had to pick one an all out favourite, it would have to be the piadina with halloumi, rocket and pesto. Really filling and delicious with a lovely mixture of textures and flavours. I hope you found this post interesting and maybe got a few ideas! What do you like eating for lunch during the week? Happy Valentine's Day! This morning I got up early and made some lovely little love heart shaped gingerbread. The recipe is a traditional German lebkuchen (gingerbread) that I got from the BBC food website and then added a few of my own twists to it. Did you know that in Medieval times on Valentine's day you gave your loved ones gingerbread, not chocolates? It was hoped that the warming spices would ignite the flames of love into the heart of the recipient!! hehe The recipe is very straight forward and the little love hearts turned out a treat. You start off with plain flour (used a white spelt flour), ground almonds, baking power and spices. I used ground ginger, nutmeg, cinnamon, clove and freshly ground black pepper. To this I added roughly chopped mixed peel and the zest of a lemon and mixed all the dry ingredients together. In a pot I melted butter (I used a vegan butter, but regular butter is what the recipe called for) and a load of honey! All the sweetness in this recipe comes from the honey, so I would suggest finding a really delicious and perfumed honey, like a wild flower or forest honey. Once they combined I added half a teaspoon of vanilla extract and then mixed all of the wet and dry ingredients together. The mixture then needs to cool down (either in the fridge for half an hour or pop it into the freezer for 15 mins) as it is very soft and you'd never be able to roll it out or shape it while still warm. I wrapped the mixture in clingfilm and when it was cool enough then rolled it out between 2 pieces of clingfilm to keep the counter clean and not have to add any extra flour to the mixture when trying to roll it out. I used a little heart shaped cutter but disks are the most traditional shape for lebkuchen. Then just pop them into a oven of 180C (160C fan) for 15 mins and leave them to cool. The recipe called for them to be iced but I like how they look without and they definitely don't need any more sweetness! Then just leave them to cool and firm up a bit and give them to the one you love! Yesterday marked the start of the Chinese New Year. Happy New Year!! This year is the year of the Snake, which is said to symbolise wisdom, intelligence and beauty, but also sadly for all those born in the year of the snake (myself included), pride and anger! But I don't believe much in the zodiac, so I'll just ignore that! Nonetheless to celebrate the lunar new year Isaac and I had a huge feast of delicious homemade Chinese food. As neither of us have any Chinese heritage and being a totally veggie meal, these would not be considered very traditional dishes however this was our spin on it. I made 2 kinds of dumplings to begin our feast. Delicious steamed parcels containing mushroom, spinach, coriander and ginger, along with irresistible potstickers with chive, quorn chicken and lots of chilli. They take a good bit of prep and are eaten in a flash but they are so worth it! I used bought dumpling wrappers just to save time, homemade really do taste better but as I knew I had a good bit to make I took the easy route. After we finished the dumplings, we had crispy sesame tofu with lots of black pepper, ginger, garlic, chilli and spring onion. I love this dish and make it all the time. The longest part of it is getting the tofu done, making sure it's deliciously crispy on all sides. The rest is easy, just getting the balance between salty, sweet and savoury. And to accompany the tofu we had a side of sauteed spinach with lashings of garlic and a dash of dark soya sauce and fluffy jasmine rice. I have to admit the jasmine rice I have is a right pain, it requires about 5 washes before you can cook it and it's still not perfect, I think we need to invest in a good rice cooker. If anyone has any suggestions, do pass them on, they'd be much appreciated! I was planning on making a lychee dessert but we were just too full and couldn't fit another bite. Instead some Jasmine tea and vegging out on the sofa watching the tv was all we could manage. Chinese New Year celebrations go on for a few days, so if you didn't have a chance to eat some yummy Chinese food you still have time, 新年快樂! Yesterday afternoon Isaac and I decided to go for a late lunch before heading for a walk along the sea front. Gnosh coffee shop is located in the middle of Blackrock market and although small, is perfectly formed. They have a very nice all day breakfast menu (which we hope to try out soon), homemade cakes and scones, as well as a very tempting lunch and dinner menu. As we dropped in around half 2 we opted for the lunch menu and decided to try out one of the sandwiches. I went for the grilled halloumi, roasted pepper, read onion, courgette with walnut pesto on sourdough bread for €5. This was very generous sandwich, filled with lots of lovely veg and the halloumi griddled perfectly (if it's over or undercooked, it squeaks as you chew!) and served on lovely fresh bread. Everything was made fresh to order, served straight away and tasted delicous. Isaac went for the slow roasted pulled pork shoulder with apple coleslaw, mayo and lettuce for €6.50. Again it was lovely generous portion, filled with very tasty, well seasoned meat that was balanced by the coleslaw and crunchy salad. Both our sandwiches were served with a dressed salad and left us feeling happy and satisfied. We ordered a tea (€1.50) and a latte (€2.50) which unfortunately were a disappointment. They weren't terrible but not great. If we had just gone in for a coffee we probably wouldn't return. However the food did make up for that. It is a family friendly coffee shop, so you can expect giddy kids hopping about the place, but with comfy couches and leather chairs, complimentary newspapers and friendly, helpful staff it'd a little gem in Blackrock.